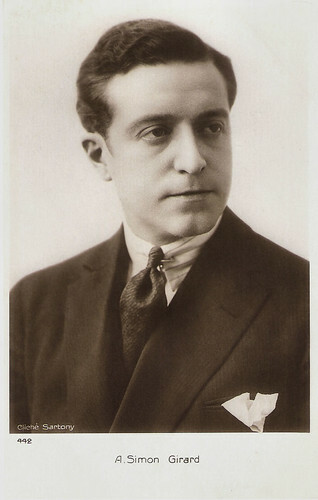 French film actor and operetta singer Aimé Simon-Girard (1889-1950) mostly played in French costume films of the 1920s and 1930s. He is best known as D'Artagnan in the twelve part silent serial Les Trois Mousquetaires/The Three Musketeers (1921), based on the famous novel by Alexandre Dumas père. French postcard in the series Nos artistes dans leur loge, no. 300. Photo: Comoedia. 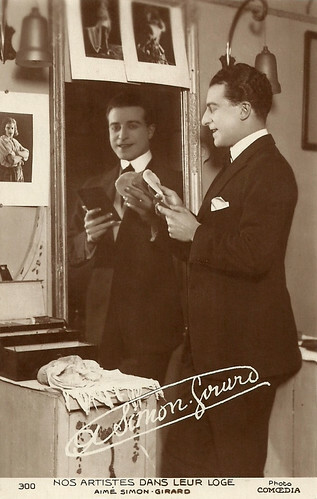 The card top right on the photo is from Les Trois Mousquetaires (Henri Diamant-Berger 1921), see it also below. French postcard by Editions Cinémagazine no. 19. Photo: Pathé Consortium Cinéma. 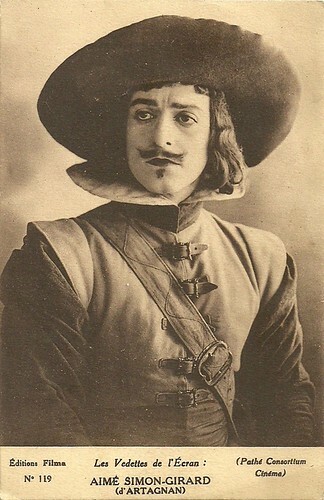 Aimé Simon-Girard as D'Artagnan in Les Trois Mousquetaires/The Three Musketeers (Henri Diamant-Berger, 1921). French postcard by Cinémagazine, no. 278. 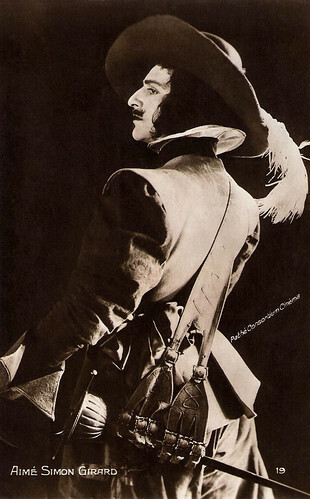 Photo: Aimé Simon-Girard as D'Artagnan in Les Trois Mousquetaires/The Three Musketeers (Henri Diamant-Berger, 1921). French postcard by Editions Filma in the series Les Vedettes de l'Écran, no. 119. Photo: Pathé Consortium Cinéma. Aimé Simon-Girard as D'Artagnan in Les trois mousquetaires/The Three Musketeers (Henri Diamant-Berger, 1921). 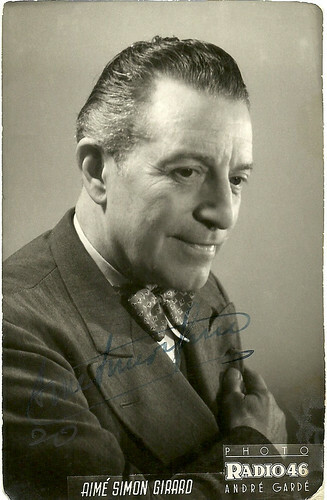 Aimé Simon-Girard was born as Aimé Max Simon in Paris in 1889 as the son of the tenor Nicholas Simon-Max and the soprano Juliette Simon-Girard. Thanks to his artistic parents he first pursued a career as operetta singer, and with success. Soon he became a star in the Parisian theatres with the name Simon-Girard. On the eve of the First World War, he started in film, playing opposite Gabriel de Gravone in La maison du baigneur/The house of the swimmer (Adrien Caillard, 1913). The following year he met the man who would launch him into cinema stardom: Henri Diamant-Berger. They made one short film together, Loin des yeux, près du coeur/Absence makes the heart grow fonder (1914), but during the war Simon-Girard mostly continued working on stage. In 1921, though, his old friend gave him the leading part of D'Artagnan in the twelve part silent serial Les Trois Mousquetaires/The Three Musketeers (Henri Diamant-Berger, 1921). It was not the first film adaptation of the novel by Alexandre Dumas père but a very popular one. For Simon-Girard it was his breakthrough role in the cinema. He played opposite such actors as Henri Rollan (Athos), Charles Martinelli (Porthos), Pierre de Guingand (Aramis), Claude Mérelle (Mylady de Winter), Jeanne Desclos (Anne of Austria), Édouard de Max (Richelieu) and Charles Dullin (Le Père Joseph). Soon cinema veteran Louis Feuillade asked him for another twelve part serial: Le fils du flibustier/The Son of the Pirate (1922), with Georges Biscot, Sandra Milowanoff and a debuting Gaby Morlay. In 1923 Simon-Girard directed a short himself, La belle Henriette/The Beautiful Henriette, with Germaine Webb. 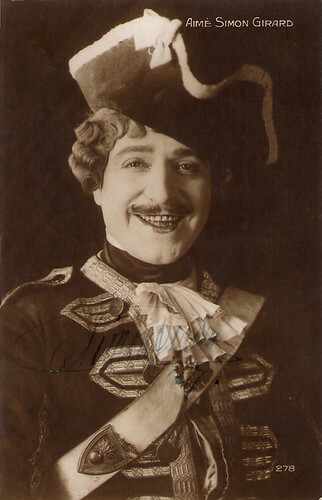 By now Simon-Girard was type-casted as a period piece actor, as in Vert galant/Courteous green (René Leprince, 1924), an eight part serial on the life of the French King Henri IV, followed by two other eight-part serials in costume: Fanfan-la-Tulipe (René Leprince, 1925) which was reshot in 1952 with Gérard Philipe, and Mylord l’arsouille/The ruffian Mylord (René Leprince, 1925). His costars in these three serials were Claude Mérelle, Joë Hamman, Claude France, Maria Dalbaicin, Pierre de Guingand and Simone Vaudry. In the late 1920s, Aimé Simon-Girard played in La grande amie/The great friend (Max de Rieux, 1927), and in the comedy Les transatlantiques/Deckchairs (Pierre Colombier, 1928) about an American family visiting France. French postcard, no. 133. Pierre de Guingand as Aramis and Aimé-Simon Girard as D'Artagnan in Les trois mousquetaires/The Three Musketeers (Henri Diamant-Berger, 1921). French Postcard, no. 171. Photo: Gaumont. Publicity still for Le fils du flibustier/The Son of the Pirate (Louis Feuillade, 1922) with Sandra Milowanoff. Collection: Didier Hanson. French postcard. Photo: Studio Fémina. 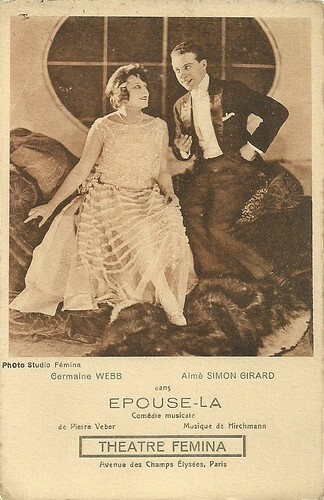 Aimé Simon-Girard and Germaine Webb in the musical stage comedy Epouse-la by Pierre Veber, music by Hirchmann, at the Theatre Fémina, Avenue des Champs-Elysées, Paris. French postcard by Cinémagazine-Edition, no. 442. Photo: Sartony. French postcard by P.C., Paris, no. 26. Because of his fine voice, the passage to sound cinema was not a real obstacle for Aimé Simon-Girard. He debuted in sound film with Les quatre vagabonds/The Four Vagabonds (1931), directed by Lupu Pick, the Rumanian master of German Kammerspielfilm. Simon-Girard wrote the French dialogue and adaptation of Les quatre vagabonds. He plays Pierre who suspects one of four young vagabonds has murdered the suitor of his beloved Marie (Simone Bourday). Next, Simon-Girard resurrected D’Artagnan once more in the sound version of Les trois mousquetaires/The Three Musketeers (1932), again directed by Henri Diamant-Berger, but this time with Blanche Montel as Constance, Harry Baur as Tréville, Edith Meyra as Mylady de Winter, and Andrée Lafayette as Anna of Austria, the French queen. Tired of the period pieces, Simon-Girard henceforth focused on the stage. In 1934, he also recorded songs like L’amour en fleurs (the French version of Gracie Fields’ Love in bloom) and Cocktails pour deux (Cocktails For two), with artists such as Django Reinhardt, being part of the orchestra of Michel Warlop. Incidentally Simon-Girard returned to the set to play a reporter in Arsène Lupin, detective (1937), which had Jules Berry in the title role, while Simon-Girard played the title role (a small one) in the Fernandel comedy François premier/Francis the First (Christian Jaque, 1937). He also played king Henri IV twice in Les perles de la couronne/The Pearls of the Crown (Sacha Guitry, 1937) and in the comedy Alexis gentleman chauffeur (Max de Vaucorbeil, René Guissart, 1938). Simon-Girard‘s last parts were in Le cavalier noir/The black rider (Gilles Grangier. 1944) starring Georges Guétary, and the two-part film Mandrin (René Jayet, 1947), starring José Noguéro. Aimé Simon-Girard died in Paris in 1950. 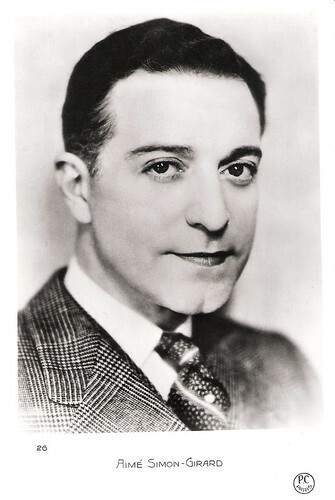 All in all, he had acted in some 20 films and serials between 1921 and 1948. French postcard. Photo: Radio 46 / André Gardé. Collection: Didier Hanson. French postcard by M. Le Deley, Paris. Photo: still from Les Trois Mousquetaires (Henri Diamant Berger, 1921), based on the famous novel by Alexandre Dumas père, and produced by Pathé Consortium Cinéma. Aimé Simon-Girard sings Cocktails Pour Deux (1934). Source: Bibi1944 (YouTube). Sources: CineArtistes (French), Wikipedia (French and English) and IMDb.